Boxed Set! Get all 10 Molding Plane Profiles and SAVE $190! ON SALE! Set includes all ten 1/2" shank carbide tipped molding plane profile router bits shown below, plus a wood storage box. Includes #7962, #7963, #7964, #7965, #7974, #7975, #7976, #7977, #7978, and #7979. SAVE $190! List $340.00. (8388). 2 flute, carbide tipped with totally enclosed ball bearing guides. These classic profiles have been copied from popular antique molding planes and are widely used to produce architectural millwork. Also used for making beautiful moldings, baseboards, picture frames, and chair rails. By combining cuts from two or more bits, an unlimited variety of profiles can be produced. 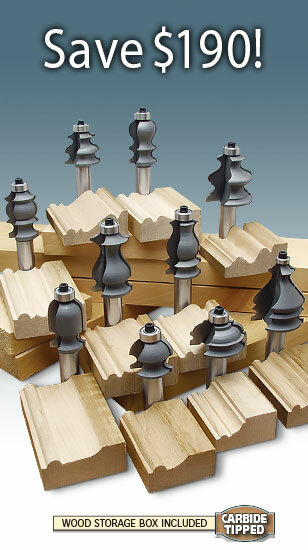 Available in a 10 Piece Router Bit Set or individually. Just finished making baseboard for a small bathroom. Now my wife wants 3 other rooms done. Great purchase with super quick delivery. This set is a great value for the money. Compared the cost of similar bits and 2 bits from other vendors can cost as much as the set of 10. I've used 5 of the profiles so far and have no complaints on the quality or durability so far. I ran over 200 feet of baseboard molding (pine softwood) on one of the bits and it is still cutting well. Although, I didn't buy the entire 10 piece set, I resently purchased the profile #7977 molding bit that is one of the profiles in this set. After trying a combination of some "basic" bits and even the multi-form molding bit trying to create just the right profile to finish off a project, I was going through a lot of test setups and a lot of test stock. I finally decided trying a bit from this collection..I'm glad I did! This bit cut smoothly and cleanly and the finished molding looks absolutely terrific! If the other profiles look half as good as this one, this set is a bargin at twice the price. This is a quality set at a great price. 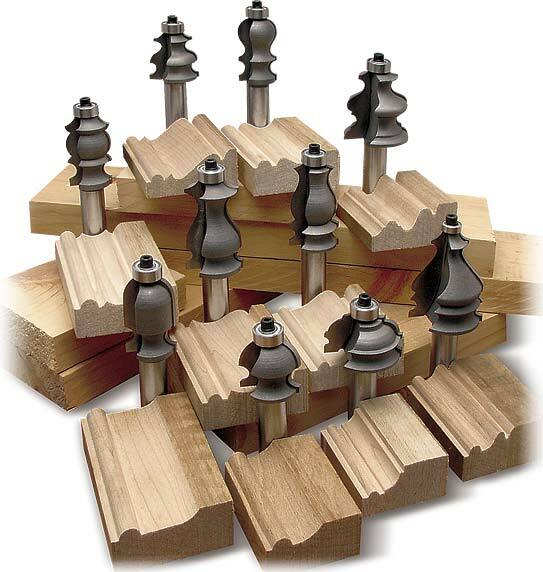 Creates very nice moldings for picture frames or decorative woodwork. The bits make a very smooth cut. I really like the antique look.